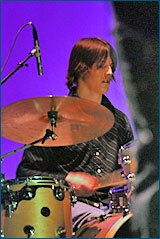 With over 25 years of musical experience, Craig Sowby has won numerous international awards and recognition as a drummer, violinist, and recording engineer. He has developed a talent for all styles of music and his engineering and drumming can be found on countless albums nationwide. Because of his extensive knowledge and background, he possesses an incredible ear for recording, and uses his training, experience, and expertise, along with a Pro Tools based system to facilitate his creativity. MyOnlineDrummer.com provides top quality drum tracks for solo musicians, producers, artists, bands, and anyone else looking to add a professional touch to their songs. You can upload an mp3, wma, or wav file. You can also include multiple files in a .zip or .rar file. For drum tracks we prefer your song be synched to a click track. If the track is not synched to a click, there may be an additional $25 fee. We will send you an mp3 of the drum tracks to preview. The first modification is free. Additional modifications are $25. What if I don’t like what you’ve sent? If you feel that our drum tracks don’t fit your music for any reason, we will refund your money. How will my drum tracks be sent? When you upload your song, you will have the choice of what format, sample, and bit rate your final tracks will be sent as. When your tracks are completed, you can login and download them at your convenience. After filling out your song info, you will be taken to the payment page where you can pay with PayPal or credit card. How do I upload my track? At the end of the order process, you will be automatically taken to our upload tool. Should I include a click track with my file? If your song was recorded to a click track, then you should be good to go. Just leave one measure of silence at the beginning. If you would like to upload your click track, please do so. How big are the final files? At 16 bit, 44.1KHz, each mono track is approximately 5.1MB/minute. So if your song is 4 minutes long and choose to receive 8 mono tracks, your total size would be around 162MB.